Electric Feels Summer 18 Mixtape! Electric Feels Best Of 2016 Mixtape! Electric Feels 2016 Welcome Mixtape!! 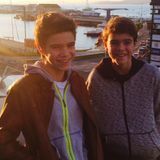 Shortly after birth the 15th years old twins Hector and Nico were already crawling through the recording studio of their father, producer and owner of a Venue. So having grown up among mixers, musicians and instruments is no wonder they are so passionate about music. But everything exploded in the 2014 edition of FestivalSInsal where only Electric Feels were talked about. No one could believe that those who went on stage were two 10-year-old children played amazing songs without stopping. After that RedBull called them for Festeen in Matadero (Madrid) and from there they were invited to participate in Ted X youth in CaixaForum (Madrid) punch that raised the audience . And from here on it has been in many festivals Marisquiño, AtlanticFest,OffAmerica, and 2016 MadCool where once again were one of the surprises of this Mega festival !. Rich Nº1 on the Mixcloud for Mixtape Best of 2016 and Pull&Bear asking to made playlist for his Spotify & Dj in several opening store parties.